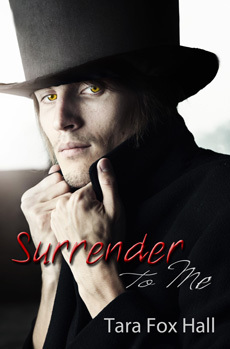 Melange Books - Tara Fox Hall - "Surrender to Me"
Former aristocrat turned lowly vampire Devlin Dalcon gets by on his supernatural charm, swindling others for money and goods. When Devlin encounters bride-to-be Annabelle—another potential victim—he finds the tables have turned as he falls in love with her. Running as fast as I could, I burst into a meadow. Anna was on the far side, cornered against a stand of fallen trees, her eyes wide. In front of her was the largest bear I’d ever seen. It was enraged, most likely because of the five arrows sticking out from it at various spots, seeping blood steadily. Her fiancé and his band of noble idiots had gone hunting today. They’d left the hunt when they got bored, left the bear to die from its wounds. The animal was mad from pain, but its death was likely days of suffering away. It would kill her in a few moments; it was already readying itself to strike. I raced to her side, and got in front of her, just in time for its claws to lay open my chest when I took the blow meant for her. I let out a scream, baring my fangs, and launched myself at it. My chances weren’t good. I had only my fangs and a knife. And the bear was much bigger than I was. It struck me again, its razor sharp claws digging deep. The pain was excruciating, and I screamed as it rent me, my fury mounting. I tried in vain to break its neck, but its bones were too strong for that. I stabbed it repeatedly, but the thing wouldn’t stop. Blood loss from my shredded chest, my clawed arms, and my chewed-on right shoulder was rapidly weakening me. With the last of my ebbing strength, I grasped one of the embedded arrows, and shoved with everything I had left. The arrow pushed deep, and the bear let out a keening sound. It clawed frantically, deepening my chest wounds, but I clenched my teeth and kept pushing. Soon, it gave its last gasp, and collapsed on me. Anna was hysterical, crying and screaming, and to risk drinking blood in front of her wasn’t optimal. But there was nothing for it; it was feed or die. So I reared back, bearing my fangs, and sank them into the bear. I drank for a long time, until my grievous wounds closed. Then I pushed the carcass off me, and sat up. Anna had calmed down, and stopped screaming. She was just out of reach, watching me intently. I imagined she was figuring she should have taken her chances with the bear. I looked over at her. “Now you know,” I said sadly.